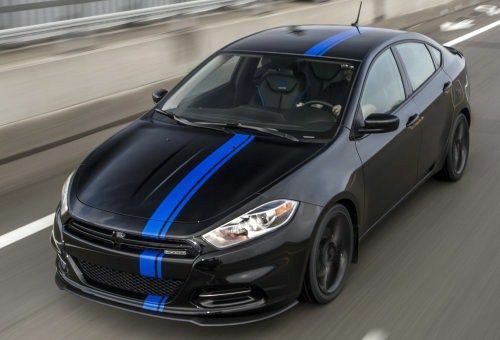 It was announced earlier this year that 500 examples of the Dodge Dart would be transformed into the Mopar 13 with a bevy of factory-featured modifications added from top to bottom and today, Mopar announced that the limited edition Dart-turned-Mopar 13 would carry a price of $26,480 (including a destination fee of $995). The Mopar 13 Dodge Dart follows in the footsteps of the Mopar 10 Dodge Challenger, the Mopar 11 Dodge Charger and the Mopar 13 Chrysler 300C – beginning with a Pitch Black exterior finish that covers pretty much everything from front to back. The body panels, the exterior mirrors, the door handles, the grille and the grille fillers are all black as are the package specific 18 inch Mopar wheels. The blacked out treatment continues into the new ground effects package that gives the Mopar 13 Dart a far more aggressive look with a chin spoiler, a rear diffuser and a low profile decklid spoiler. The exterior of the Mopar 13 Dodge Dartupgrades are finished off – again like the previous Mopar vehicles – with a Mopar Blue “driver’s stripe” running from the front to the back and chrome Mopar badging on the trunk lid and in the grille. The exterior also includes a set of black chrome headlight bezels and the gorgeous LED “racetrack” taillight that are not specific to the Mopar package but they are features that are most certainly worth mentioning. On the inside, the Mopar 13 begins with all of the standard goodies of the Dodge Dart Limited but Mopar has added unique Katzkin leather seats with a Mopar blue Katzkin leather driver’s seat with black stitching, black Katzkin leather passenger and rear seats both of which feature blue accent stitching, a black leather wrapped steering wheel with blue stitching and a black leather shift knob – also with blue accent stitching. Next, a black chrome instrument panel, Mopar Blue interior accent lighting, a Mopar pedal kit, Mopar doorsill guards, Mopar premium floormats, a serialized dash plaque with the number out of 500 and a Mopar wireless charging pad. This is in addition to all of the standard features of the Dart Limited like the 7” TFT customizable gauge cluster and the huge 8.4” infotainment screen. Finally, no Mopar vehicle would be complete without some performance enhancements so the Mopar 13 Dart begins with the optional 1.4L turbocharged 4-cylinder engine that sends 160 horsepower and 184lb-ft of torque to the front wheels via a proper 6-speed manual transmission. Next, Mopar added a cat back exhaust system, a sport tuned suspension system that allows the Mopar 13 to sit about 7mm lower than the standard Dart Limited and a performance braking package that included slotted front rotors and high friction pads. In the long run, the actual Mopar 13 package consists of the blue driver’s stripe, the black 18” wheels, the ground effects package, the Mopar badging, the unique Katzkin leather front and rear seats, the leather covered steering wheel and shift knob, the blue interior lighting, a serialized Mopar 13 badge, a collection of black interior trim pieces, sport tuned suspension, the performance front brake package and Mopar exhaust – with a package price of $4,190. When you look at all of the unique features of the limited edition Mopar 14, the package price doesn’t seem like that big of an increase…especially when you consider the fact that only 500 examples of this sporty compact sedan will be built so this Mopar-designed Dart is an instant collectable. Some Mopar lovers have questioned the decision to use the front wheel drive Dodge Dart sedan as the base vehicle for the Mopar 13 after the first three Mopar branded vehicles with all rear wheel drive, Hemi powered beasts. However, the Dart is one of the most powerful (yet efficient) cars in the class and with all of the interest in this sporty new compact sedan – this is a vehicle that is likely to resonate well with those who are looking to rep the Mopar brand.